With all of the new advances with Facebook technology, the site has grown to become one of the most widely-used websites in the history of the internet. One of the best features that Facebook has developed over the years is that you can make a Facebook timeline of the events of your life. In this way, Facebook serves as a scrapbook of sorts, and it is a virtual scrapbook that can be viewed any time by you and your friends. The old-fashioned photo albums and scrapbooks are things of the past, and a new era of technology is ushered in with Facebook timelines. In a Facebook timeline, you can store photos, messages, events, status updates and anything else you deem important to preserve. All of the great memories you’ve had recently can be placed into a Facebook timeline, and you’ll always remember how good the times were. The best part is that these timelines can never be erased unless you choose to do so. All of your memories will be kept safe and sound on a Facebook timeline. Pictures of girlfriends, boyfriends, important events, things you find interesting and more can be kept in a Facebook timeline for safe-keeping. More often than not, you will get incredible comments on your timeline, and people will make their own timelines after they see how great yours is. Facebook timelines are a convenient way to share your life with the people you would like to share it with. Ancient scrapbooks and photo albums are only useful if the person is in the room with you. In this new age of information sharing technology, you can make your life available to people online. Just as you would share with people in person, your online family can now read and see the events that have shaped your life on a Facebook timeline. Precious photos, memories, posts by friends, comments, status updates and more will always be there for you to take a trip down memory lane. If you’ve had a photo that many people enjoyed and left comments on, you can etch it into your Facebook timeline, and it will be in a convenient place as one of the more important moments of your Facebook experience. The easy to use Facebook timeline is like a time capsule, since people years from now will still be able to see your timeline, if you’ve left it available. When you look back upon your life, you will be glad to have a Facebook timeline, because it keeps all of your important memories in one place. Facebook timelines are a great asset to have. When your friends and family are miles away from you, you can still share all of your best memories with them. There are few things more important in life that creating lasting memories and you’ll want to preserve the memorable moments of your life forever. Facebook timelines offer people a great way to always have their fondest recollections handy. Consider making a Facebook timeline today, as you have nothing to lose. One of life’s greatest pleasures is taking pictures and keeping the memories forever. Facebook Timeline makes sharing your life easier so Zienna Miller is excited to post pictures of her two new exotic pets, teacup pigs Porky and Babe. 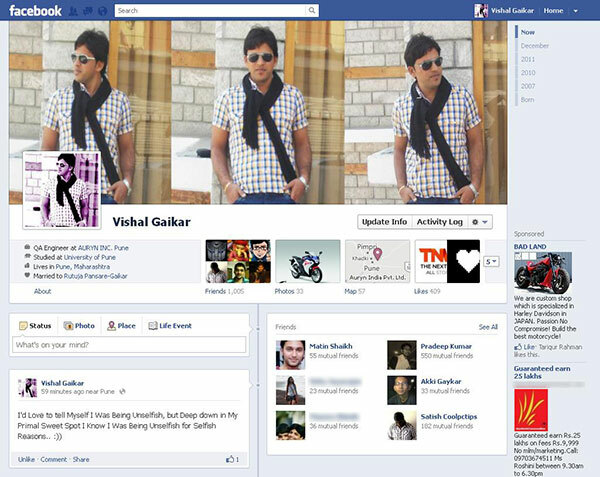 If you haven’t activated timeline yet then activate for your profile using following link.